Discussion in 'Celebrity Singers/Musicians' started by rosalynn, May 12, 2009. I've searched and couldn't find a topic on Alesha Dixon, so thought I'd pluck up the courage to post a new thread. "Alesha Anjanette Dixon (born 7 October 1978) is an English singer. After finding fame in the all-female trio Mis-Teeq, she is now a solo artist. Her career began in 1999 when she met Sabrina Washington when they both joined Dance Attic (a popular hip-hop/jazz dance academy in West London), and together they formed a duo and recorded a demo titled "Inspiration". During an audition, they met with Su-Elise Nash and then together they formed a trio. They were soon signed to Telstar Records with the addition of a new member, Zena McNally, and became the popular UK garage/R&B girl band, Mis-Teeq. Her 2008 single "The Boy Does Nothing" was her first top ten solo hit on the UK Singles Chart, peaking at number 5 and spending over three months in the UK Top 40. "The Boy Does Nothing" has also charted in other countries, reaching number 1 in Spain, number 2 in France, Finland, Hungary and Luxembourg; number 3 in Norway and Turkey and number 4 in the Czech Republic. 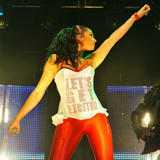 Her second single from album The Alesha Show, "Breathe Slow", was her second solo UK top ten hit, peaking at number 3. She will soon be supporting Enrique Iglesias on a world tour, which was leaked on the BBC show Something for the Weekend on 9 November 2008. It was announced that Alesha will embark on a 17-date UK tour, beginning on the 20th October, 2009 in Nottingham. The tour will be titled "The Alesha Show"
I quite like her style. It's a bit up and down, and sometimes I get the feeling she's trying a little too hard, but when she gets it right it looks effortless, and she looks gorgeous. Her hair and makeup are also very wobbly. She changes her look quite a bit, sometimes her makeup is really understated, and sometimes she wears pink lipstick to match her shoes - sometimes her hair is really flat and dull, but when it's styled it looks incredible. What do you guys and gals think? And do you have any more pics of Alesha? Hope you enjoy this post. Last lot of pictures. Love her hair in the first 3. I like her style in #3 and the 1st and 4th row in #2, but sometimes (most of the time?) she prob tries to hard perhaps. One of the most beautiful women I've ever laid eyes on. Not liking her new music stuff much either. She was on Freshly Squeezed this morning. I think in a way she comes from the Paris Hilton school of fashion and is a bit too matchy matchy. She was wearing a hot-pink blazer and matching hot-pink heels. She often does this. I think subconciously I've always ignored her trying too hard with stuff like that and remembered her for her beauty more than her style perhaps? It's strange, because having started this thread I kinda agree with miss_nyc although there are times she's looked gorgeous in every way. I wish there were more candids of her. I think her style is probably 70% miss, 10% awful and 20% nice for me having thought about it more. Here are some caps I grabbed from TVCatchup. Alesha Dixon 2008-11-08 - performs on stage at G-A-Y in London (celebcity). I love her. She's so beautiful and her music is fantastic. She also seems like such a sweet woman, I've seen some paparazzi videos of her and she came across so well. Agree. I love her album and she´s a great performer. And I´ve seen her in Kilimanjaro Climb document and she seemed to me like such a sweet person. She always comes across really nice She was so humble and so talented when she did Strictly Come Dancing. But I definitely get the impression that she is also a no bull**** kind of person. I love "The Boy Does Nothing"
I saw her in Cannes, she was absolutely beautiful! And even when she was reharsing, with her curly hair undone, and I think she was wearing a pink romper, she was still gorgeous!